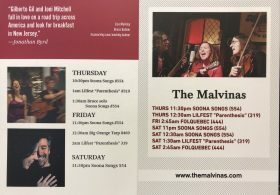 Lisa will be doing double-duty at this year’s Folk Alliance, performing with Markley&Balmer and The Malvinas. The great sleep-deprived folk-schmooze free-for-all that is Folk Alliance International will being held in Montreal this year, Feb 13-17. Soona Songs, the wonderful label which we are proud to be a part of, will be our base camp. We will be roaming the halls, singing in the stairwells, and lounging in the lobby, taking over the hotel along with a couple thousand other folk-inclined musicians from all over the world. If you are a DJ, a venue operator, a festival promoter, a house concert host, or even (especially) a booking agent, look us up. You’ll be glad you did!